In September, Rep. Tulsi Gabbard (D., Hawaii) gave a speech to remember—at least according to a Russian propaganda outlet. Speaking on the House floor, Gabbard chastised the United States for supporting Saudi Arabia's war against the Iranian-backed Houthi rebels in Yemen. "The U.S must end its support for Saudi Arabia and stop waging interventionist wars that increase destruction, death, and suffering around the world," Gabbard said. Weeks later, RT endorsed her remarks. "Speeches that still matter," the Kremlin-backed English-language television network tweeted, along with a clip of Gabbard speaking. "End U.S. interventionism around the world!" RT is not the only unsavory source to support Gabbard's foreign policy views. But why should that matter? Many members of Congress have terrible, even dangerous views on this or that policy. Gabbard, however, is a rising star on the political left, and she is running for president in 2020. Moreover, she has separated herself from other candidates by making foreign policy her principal focus. "There's one main issue that is central to the rest, and that is the issue of war and peace," she said earlier this month. Gabbard's views on foreign policy matter, and that is troubling. Opposing military interventions and so-called "endless wars," especially to pursue regime change, has long been a tenet of the left's politics. But Gabbard applies the term "interventionist" irresponsibly, without regard for facts. Take her speech about Yemen. The United States and Saudi Arabia are actually pursuing the opposite of regime change or nefarious meddling there, supporting the legitimate, internationally recognized government of Yemen, which the Houthis toppled through force in 2014 and 2015. Yet Gabbard characterizes Riyadh and Washington as uninvited intruders when in fact the Yemeni government called for their military support. Either she is ignorant or dishonest. Neither option is desirable for a commander in chief. Gabbard takes the left's traditional stance against intervention to the extreme, especially in the Middle East. Her bizarre and shameful support for Syrian President Bashar al-Assad is well known at this point. In 2017, she met with the Butcher of Damascus, who is complicit in the murder of about 500,000 Syrians and the displacement of millions more since 2011. She has consistently defended Assad and questioned that he used chemical weapons on his own citizens. She has parroted talking points from Moscow, Tehran, and Damascus saying all forces opposing Assad are terrorists. Gabbard's campaign website even has its own tab titled "End the War in Syria: End the illegal, counterproductive war to overthrow the Syrian government of Assad." The congresswoman has a bizarre obsession with the Syrian dictator. 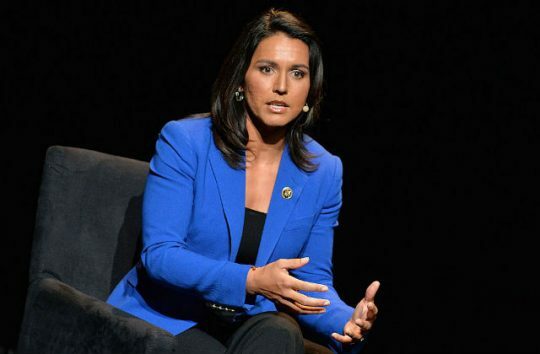 Gabbard's stance on Assad and Syria has earned her praise from two deans of American foreign policy, white nationalist Richard Spencer and former Ku Klux Klan leader David Duke. Good company, indeed. Gabbard is of course selective about her love for dictators. She cozies up to Assad but trashes the Saudis. There has always been an obvious inconsistency in America's approach to autocrats. But that inconsistency is to support allies who serve American interests and to oppose adversaries—not the other way around! Yet the other way around is the posture that Gabbard and a growing number of Democrats have taken toward the Middle East. Strangely, despite being a progressive, Gabbard has a somewhat hawkish stance on the war against Islamist terrorism. This view has earned Gabbard the admiration of Steve Bannon, who arranged a meeting in 2016 between her and then-President-elect Trump. "When it comes to the war against terrorists, I'm a hawk," she said earlier that year. "When it comes to counterproductive wars of regime change, I'm a dove." That slogan might be good for bumper stickers, but the two ideas contradict one another. Gabbard supports strong military action against terrorists but is adamantly opposed to any serious commitment in the Middle East. To be clear, when Gabbard says "counterproductive wars of regime change," she means any meaningful, sustained effort of coercion. This is a recipe for doing just enough to enrage a lot of Muslims in the Middle East, but not enough to do anything of consequence to stop Islamist terrorism in the long run. No one wants endless wars, but the United States needs some soldiers on the ground and the will to stay committed to the fight. Another problem with Gabbard, implicit in many of her foreign-policy stances, is that she blames America for much of the world's chaos, not the adversaries who murder without regret. Last year, she justified North Korea's belligerent pursuit of nuclear weapons, saying that Kim Jong Un was pressured into building an arsenal. "Our country's history of regime change has led to countries like North Korea to develop these weapons," she said, adding that Pyongyang "sees what we have done in countries like Iraq." Gabbard went on to blame "decades" of American policies by Republicans and Democrats for the current situation. Gabbard's foreign-policy views would make the world more dangerous and embolden anti-American autocrats. And like other progressives who "champion" human rights, her foreign policy would make humanitarian disasters more likely, as no leaders would fear American power. After all, we wouldn't want to do anything to make Bashar uncomfortable. This entry was posted in National Security and tagged 2020 Election, Bashar al-Assad, Foreign Policy, Syria, Tulsi Gabbard. Bookmark the permalink.